Testosterone replacement therapy (TRT) is known as the customized prescribing of testosterone treatments/preparations, along with their respective dosages and frequencies. There are several of testosterone treatments, and many reasons to select one over another. For example, bodybuilders and recreational users prefer testosterone injections to tablets because it permits them to circumvent hepatotoxicity (liver toxicity) issues. Hepatotoxicity has to do with oral steroids making their initial trip through the liver (prior to entering the bloodstream to work), during this trip they increase liver toxicity which throws liver values out of whack. Such users also favor injections because oral medications possess short half-lives, which cause them to both work and stop working rapidly, often requiring one or two daily doses to maintain even blood serum levels. Each of the treatments cited here provides adequate levels of hormone replacement along with their respective pros and cons. The trick is to find the one that best suits your lifestyle. Oral tablets will always be wildly popular due to their vitamin-like convenience and extreme ease of use. Many men prefer this method not only because they're already accustomed to taking vitamins, but also due to their discomfort with needles. As mentioned earlier, tablets are harsher on the liver than other testosterone treatments, and are generally taken daily or twice daily to ensure the proper dosage/stability throughout the day and night. For some though, they can also be too easy to forget making them a poor choice for such men. Orals can also give a roller coaster effect with having high then low levels when dosages are missed. Many men also only get a mild bump in total elevation of testosterone levels. Another viable testosterone treatment is the patch. The testosterone patch comes in varying dosages and brands including the more popular Androderm. Although reportedly uncomfortable to some, most users are completely unbothered by the patch. It does require daily changing, yet it remains a popular delivery mechanism. Previous versions of the testosterone patch were affixed to the scrotum, but today's patch can be applied to any clean, dry area of the back, stomach, upper arms, or thighs. It is necessary to rotate sites daily, allowing at least 7 days before reusing a site. Some users report experiencing allergic reactions to the patch's adhesive, which can cause a variety of skin irritations. Some patients also get only the mild bump in their total elevation of testosterone level or none at all after a period of time. Intramuscular (IM) testosterone injections can be shot directly into your muscle where they are then absorbed into the bloodstream via the capillaries. IMs are extremely popular because of their differing time release characteristics, and also because they don't cause liver toxicity complications. IM testosterone therapy is generally esterified - an ester is added to the testosterone treatment to control the speed of release and rate of activity within the body. 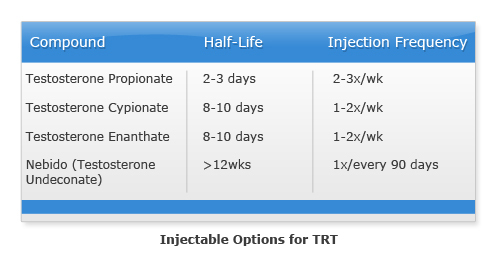 A major misconception of the half-life interpretation is that many doctors, TRT clinics alike use the testosterone half life as guide to administer inject times. Take for instance Cypionate (12-16 days ) there are many educated physicans that prescribe one injection every two weeks or 3 injections a month according to the medications physical half-life. This is wrong wrong wrong and gives the patient a roller coaster feeling as testosterone levels go up in the first few days then crash. 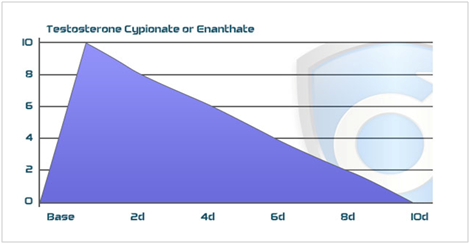 Cypionate as well as Enthanate which are the two most common forms used in the medical setting will boost testosterone levels to there peak in 36-48 hours and then drop fairly quick to baseline. For best results patients should inject twice per week or once a week maximum to maintain a homostatic levels that best replicate our testosterone levels when we were 20-25 years old. Some other injectable preparations are considered hybrid blends, as the combine fast, moderate, and slow ester testosterones into one testosterone treatment. The benefit of these is the different half life peaks of the multi esters giving testosterone levels scheduled boosts over a greater period of time. The wildly popular Sustanon 250 has the best reputation, along with its close relative Omnadren 250. The two of these products, and other similar ones, are best taken more frequently early to benefit from the short esters, and then less frequently after the long esters have kicked in/accumulated within the bloodstream. Testopel is a subcutaneous crystalline testosterone pellet manufactured by Organon. This testosterone treatment has been fully approved in the U.S. for the treatment of men with testosterone deficiency syndrome. This long-acting pellet is inserted subcutaneously (between skin layers), and provides a continuous testosterone release for about 3-6 months. Testopel may not be as popular as some of the other testosterone treatments mentioned here, but this pellet is just as effective. The downside is patients are required to undergo a surgical procedure to implant the pellets each time and the sensation of the pellets to some are annoying and bothersome.